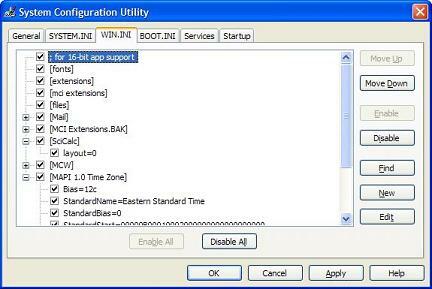 This section describes the system startup file, WIN.INI, and how to change it with the system configuration tool 'msconfig.exe'. Similar to SYSTEM.INI, WIN.INI was another system startup file that was used in versions of the Microsoft Windows operating environment up to Windows 3.11 to store basic settings at boot time. Many of these settings were honored in Windows 9x, although the files had begun to be phased out in favor of the Windows registry. Windows XP still acknowledges some entries in the WIN.INI file, to provide backwards compatibility with older 16-bit applications.